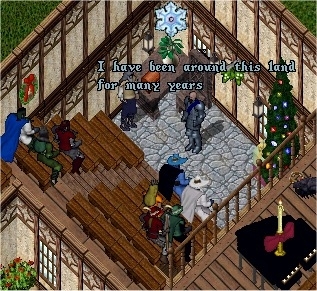 The year of 2004 was a bit of a change for the City of PaxLair. Quests, events, meetings, plays, wars, diplomacy with other striving communities and news reports all flourished for the first time since the old days. Three impressive outposts were established, the Ministry Council was reformed and Chancellory created to provide everyone with the kind of political-roleplaying that PaxLair is famous for. 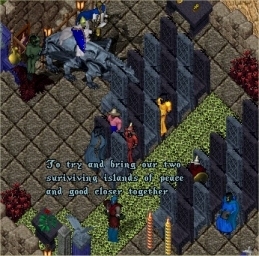 Dragons Watch and Army of the Dragon became closely affiliated with PaxLair, and the bond continues this day. 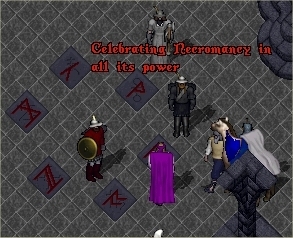 As we move into the new year of 2005, where PaxLair will celebrate seven years of existence on the Felucca moon, I thought a pictorial look back on this year's events would be most appropriate. The old PaxLair Inn fell in early January. 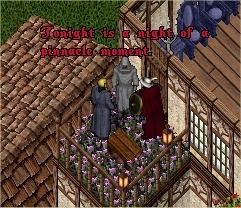 The Inn was owned by Catherine for many years and was home to many famous Paxlairians over the years. 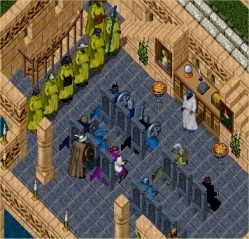 The PaxLair 6th Anniversary Celebration is frequented by many, including PKs from the [NfC] guild. After plenty of death, spirits were regained and a powerful speech was given by Mayor emeritus Winfield. PaxLair hosts its first ever Doom hunt. Uncoordination and death is forefront, but this hunt provides a good learning lesson for a year's worth of highly successful hunts. Thanks to the help of Gamemaster Carbon, PaxLair's Fire Monument had its flame restored. Several blessings around town were also fixed. 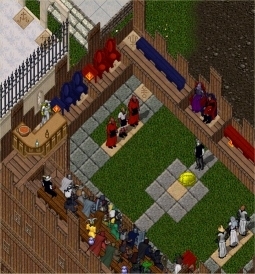 A bagball matchup between the PaxLair PeeKayS and the Mythndale White Wyrms is set for March 1st. Uniform colors are modelled and chosen at the weekly meeting the week prior. The PaxLair-Mythndale Bagball matchup is held at the Bagball Stadium in Silvervale, and the PaxLair PeeKayS face an overwhelming loss at the hands of the Mythndale White Wyrms! Several rule discrepancies are to blame including the weight of the bagball and the ability to drag it. A rematch was challenged by Mayor Minsk but alas it never happened. A series of season-long Gatekeeper quests begin with a short quest to seal a fissure out at sea. 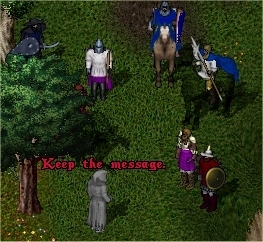 The Gatekeeper tells questors to "Keep the Message", which was the mantra LRU, after the first short quest. 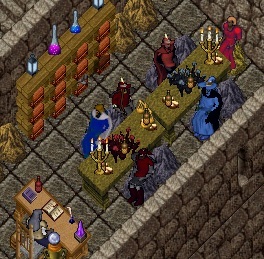 PaxLair meeting attendees visit the twin cities of Luna and Umbra to examine the conflict first-hand between Paladins and Necromancers. 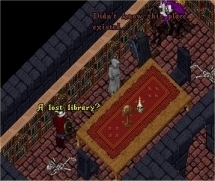 A few months later the Twin Towers of Chivalry and Necromancy are setup in PaxLair. 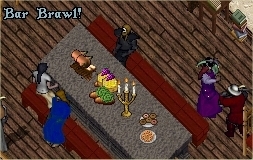 A mock bar brawl is staged between Wizzie and Neo Of Lothlore while touring the Drunken Bull Roadhouse in Malas with the PaxLair meeting attendees. 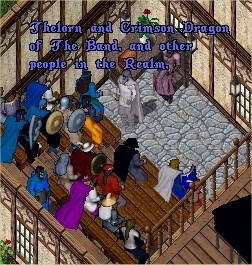 Adventurers meet the wandering scribe while at a net toss in Buc's Den, Trammel. The scribe had written a book titled "Strange Shifting" where an odd flash of light and sound were heard, followed by the mantra ATRA SOPOR spoken by a passing spirit. The Gatekeeper perhaps? 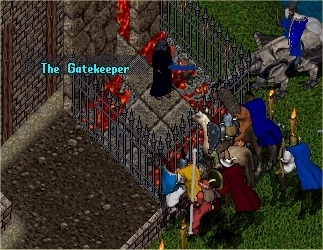 Adventurers follow the Gatekeeper through the old dungeon of Deceit. In this frame Sibelius makes his way across a bridge. JEG of The Hemp Clan returns to PaxLair to announce a special event at Humility Village in the coming weeks. The Hemp Clan's special event turns out to be a farewell celebration with a giant champagne toast. THC then collapsed all of their houses and gave away all of their possessions! Leader of ATD, John McBain requests a close alliance with PaxLair. 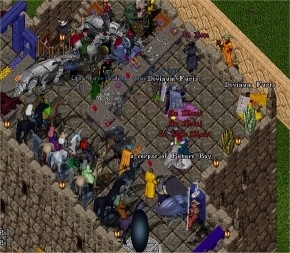 PaxLair citizens begin to attend ATD and Dragons Watch events and the reverse. Just one of the many times PaxLair attended the Red Wolf Cafe's events, as part of a community co-operation initiative. 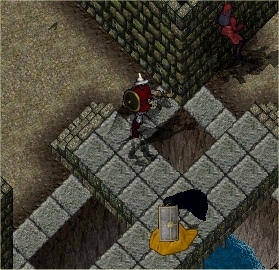 In this frame a Naked Dungeon Escape has taken place. 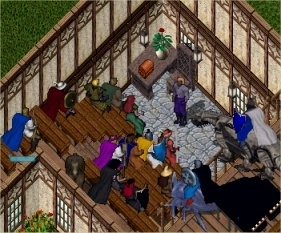 "The Band" PaxLair Town Hall is constructed and christened in front of a large audience. Meetings from this point on were held at the Town Hall's Auditorium and unfriendlies were kept to watch from the windows at the back. The Last Man Standing PvP Contest is held atop the Order tower in PaxLair as part of the Chesapeake Summer Festival. The Gatekeeper is seen in physical form after the Underworld Gate springs out from the soil near the northern Britannian coastline!! Adventurers are invited inside and are given the task of collecting items for a special forge. 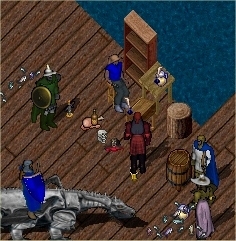 After being kidnapped for several weeks, John McBain of ATD is returned safely to Dragons Watch where he appoints Primus as Mayor. After much discussion and negotiation, the City of Dragons Watch becomes an outpost of PaxLair. 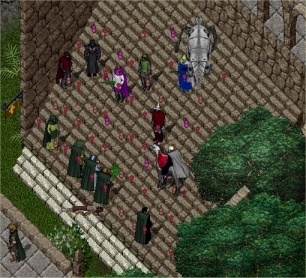 Minsk is declared overall Mayor and Army of the Dragon becomes a citizen guild of PaxLair. PaxLair hosts a pilgrimage across Chesapeake and visits such noteworthy places as Umbra, the Falconers Inn, and Silvervale. 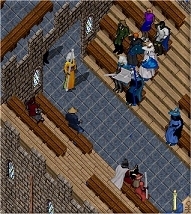 The PaxLair Chancellory holds its first meeting, and John Duke is appointed Minister of Diplomacy. 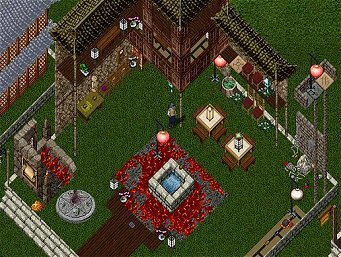 A PaxLair Outpost on the Tokuno Islands is founded, with a Tea House as its center! 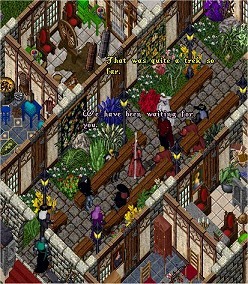 Many other buildings are acquired too including an Armory, Gardens, Inn, Stables and twin temples of Order and Chaos. Within a few days the Tea House sprung a leek and a replica of the Spring of Courage appeared at its middle! It soon became corrupted with fire and ash though, and hasn't yet changed back. 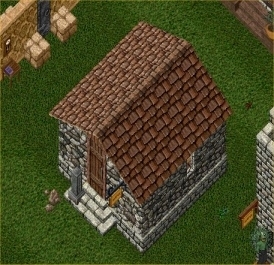 Another PaxLair Outpost opens, this one at the Malas Orc Fort where several citizens own homes. A weekly meeting is held at the main building, the auditorium in this frame. 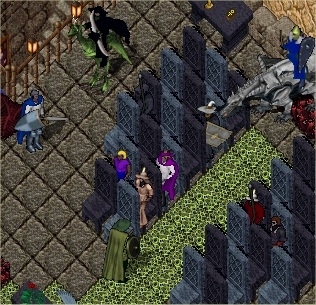 Because of Guildmaster John McBain's absence in a far away land, King Id is appointed as the new GM of Army of the Dragon. 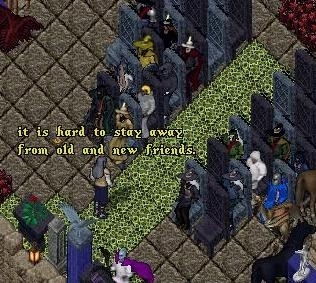 Farewells are said to our friend and ally Valiant Kurgan, Lord of Corwyn who has chosen to leave the realm. 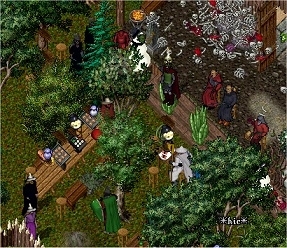 The Year's events are rounded out with the annual Orcmas Party - this one held outdoors at the new Orc Village east of PaxLair, Felucca. The Year of 2004 was filled with many moments of joy, fun, and at times uncertainty. Now a new year is upon us, three successful outposts and one parent town stand behind a group of hard-working and dedicated citizens keeping things interesting and alive! Two-thousand-and-five is just around the corner, as well as the celebration of PaxLair's 7th Birthday! Happy New Year Everyone! Have a good one! !